A 1941 aerial view by Stan Oliner (courtesy of Jim Urdea) looking northeast at Englewood Airport. 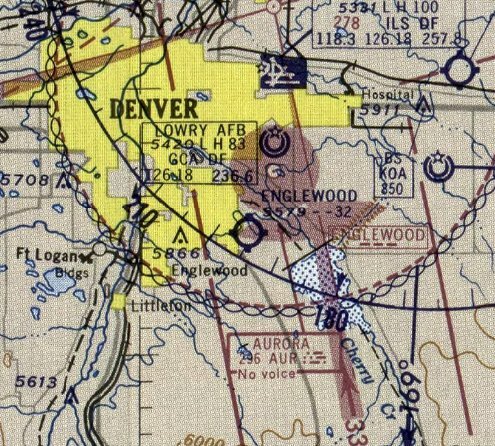 Jim Urdea reported, “The Englewood airport was located 6.5 miles southeast of the Colorado State Capitol Building & only 4 miles south/southwest of Lowry Field. 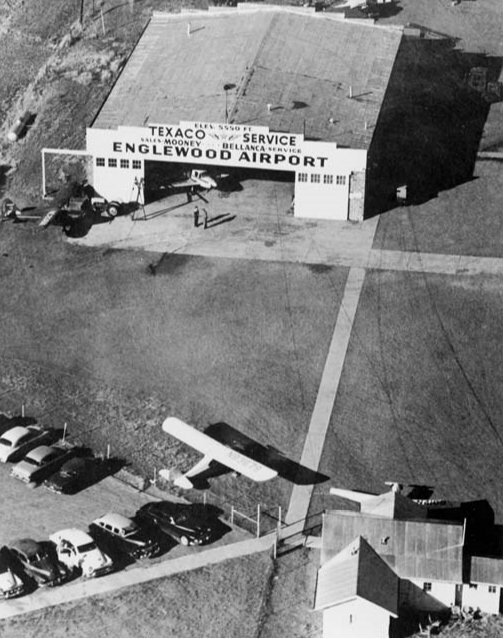 Englewood Airport appears to have come into existence before WW2, with the earliest located photo being a 1941 aerial view by Stan Oliner. as it was not depicted on Denver Sectional Charts up through the August 1945 edition. 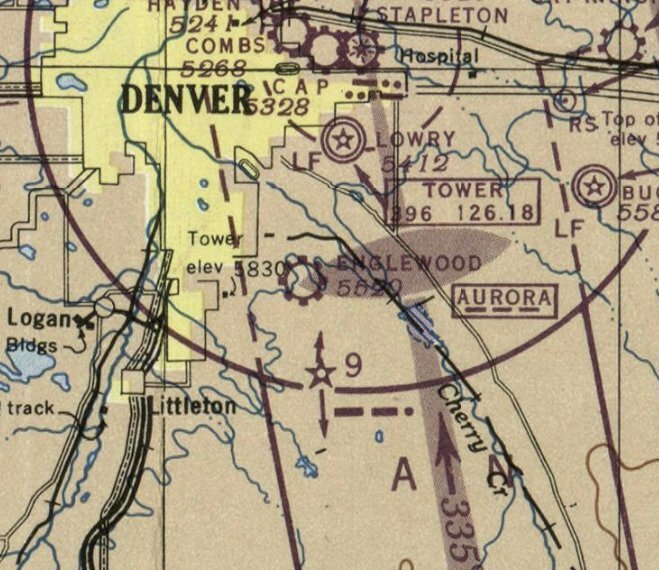 The earliest aeronautical chart depiction which has been located of Englewood Airport was on the March 1946 Denver Sectional Chart. 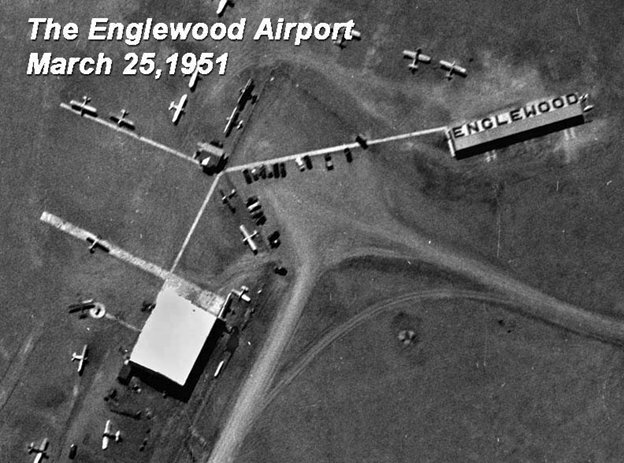 It depicted Englewood as a commercial/municipal airport. 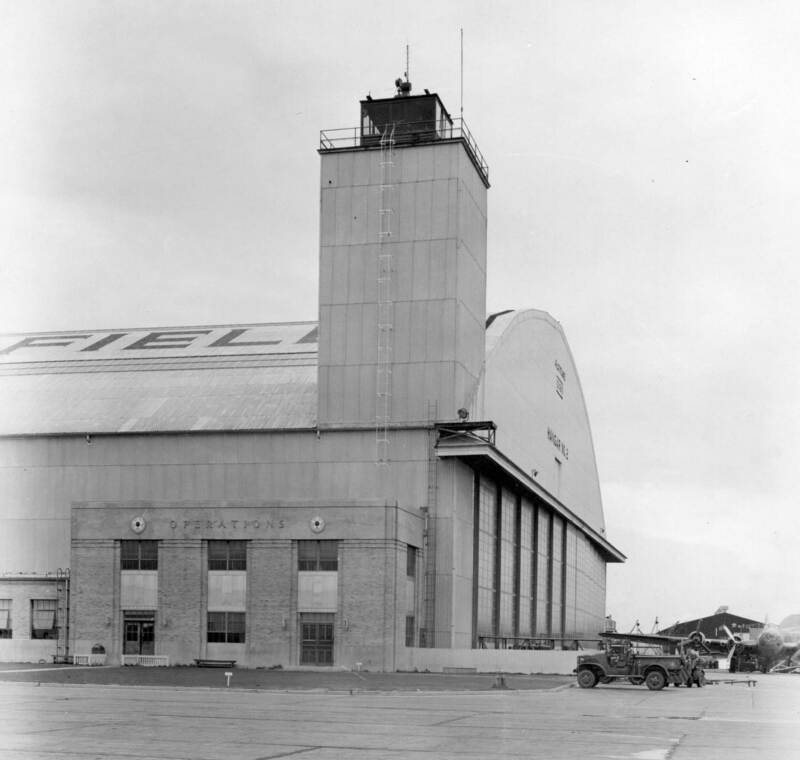 A 1946 photo (courtesy of the Englewood Public Library) showed an unidentified pilot, several aircraft, and the hangar at Englewood Airport. A 3/25/51 aerial view looking southeast at Englewood Airport (courtesy of John Young). Jim Urdea noted, “It showed the addition of a covered aircraft parking structure, Englewood painted on the roof, southwest of the main hangar, wth the airport’s office building between the two structures. 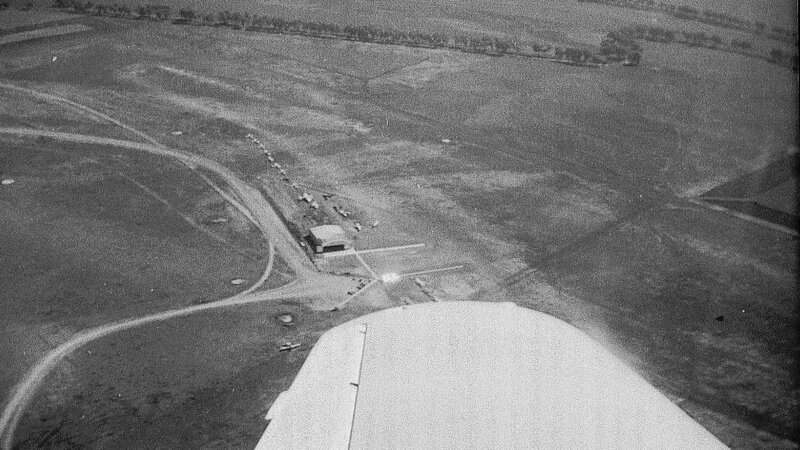 A September 1953 USGS aerial view of Englewood Airport (courtesy of John Young). A 1954 aerial view looking northwest at the Englewood Airport hangar (courtesy of John Young). 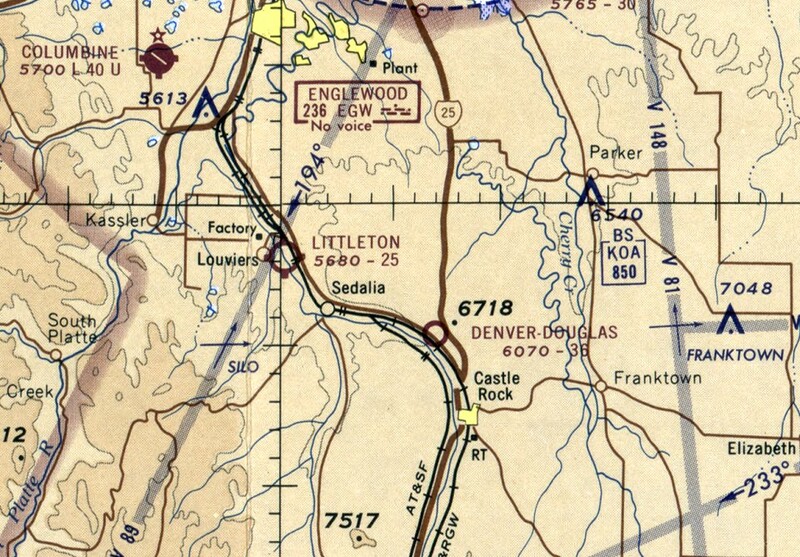 Englewood Airport, as depicted on the 1957 USGS topo map. Jim Urdea noted, “USGS topographic maps make no mention of the airport until 1957 after it had been in operation for at least 16 years. 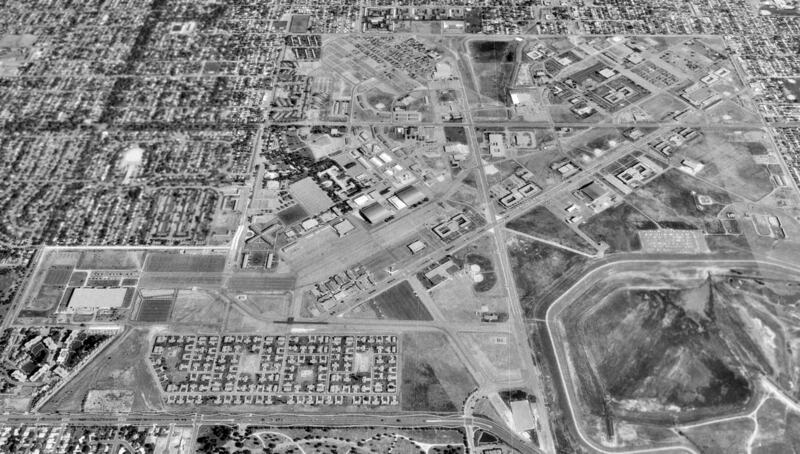 and upgrading of the Valley highway into I-25 through the 1950s signaled the beginning of the end for Englewood Airport. 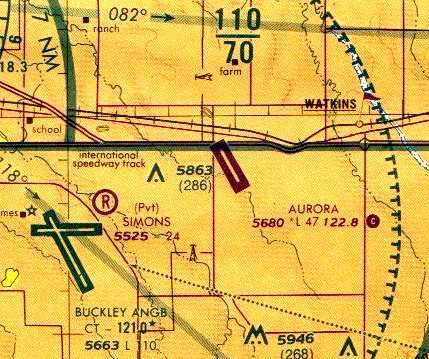 The last depiction which has been located of Englewood Airport was on the May 1959 Denver Sectional Chart. It depicted Englewood Airport as having a 3,200' unpaved runway. 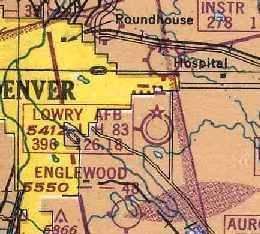 Englwood Airport was no longer depicted on the November 1959 Denver Sectional Chart. A 2018 aerial view looking northwest showed no trace remaining of Englewood Airport. The site of Englewood Airport is located south of the intersection of Manaco Parkway & Yale Avenue. 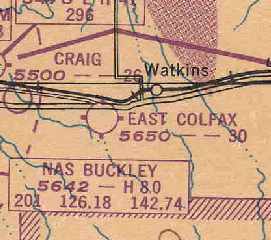 C & S Airport, as depicted on the June 1965 Denver Sectional Chart. This small general aviation airport may have gone by a succession of names over its brief lifespan. as it was not yet depicted on the 1963 Denver Sectional Chart. 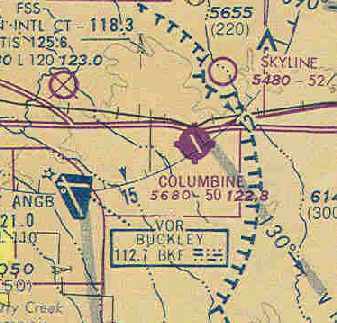 The earliest depiction which has been located of C & S Airport was on the June 1965 Denver Sectional Chart. 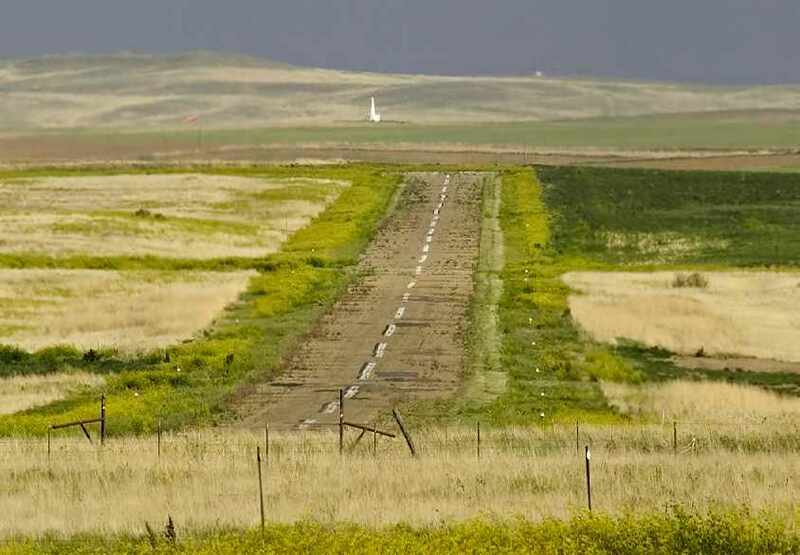 It depicted C & S Airport just east of Cherry Creek Reservoir, and having a 3,000' unpaved runway. 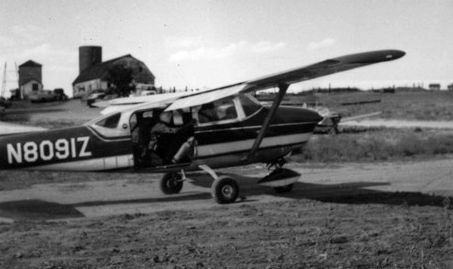 An August 1966 photo (courtesy of Ted Frison) of a Cessna 206 equipped for skydiving operations at Cherry Creek Airport. which I remember as being somewhere just east of the Cherry Creek Reservoir. It was fairly primitive. We did our jump training in a barn & I have no recollection of an Fixed-Base Operator, although there may have been one. The strip was owned by a farmer. We had to be careful about our operations, lest we interfere with Buckley ANGB. 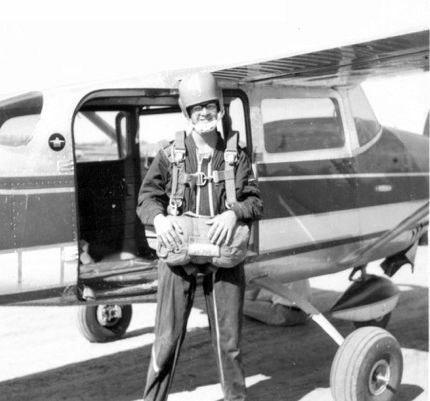 An August 1966 photo of Ted Frison ready to jump (“at age 16 - before my driver’s license”) front of a Cessna 206 equipped for skydiving operations at Cherry Creek Airport. Ted Frison recalled, “I landed - alive to the relief of my dad, who had to drive me there because I didn’t yet have a driver’s license! 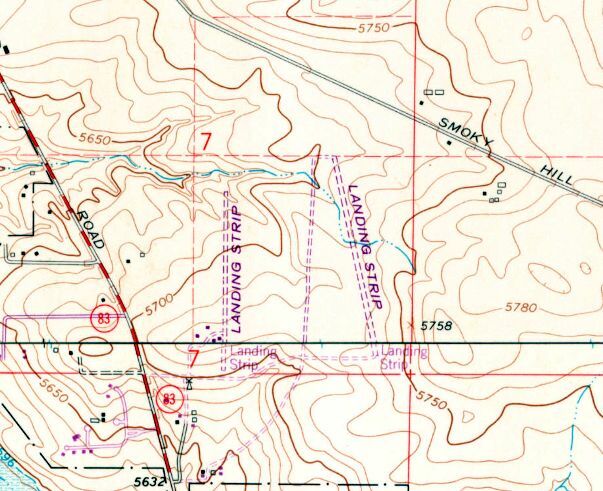 The 1971 USGS topo map depicted 2 unpaved north/south runways separated by only a quarter-mile, both labeled simply as “Landing Strip”. Were these part of the same airfield, or two unrelated airfields in close proximity? 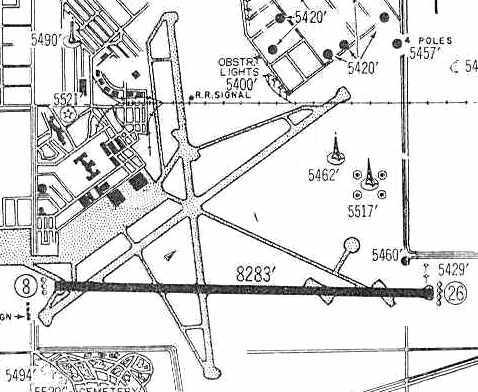 The 8/15/74 Denver Terminal Chart (courtesy of Ted Frison) depicted Stouts Airport as a private airfield having a 2,600' unpaved runway. Ted Frison observed, “There is on the chart a private airport called Stouts just south east of the reservoir, along the road to Parker & it's possible that's where we jumped. as it was no longer depicted on the February 1977 Denver Sectional Chart. 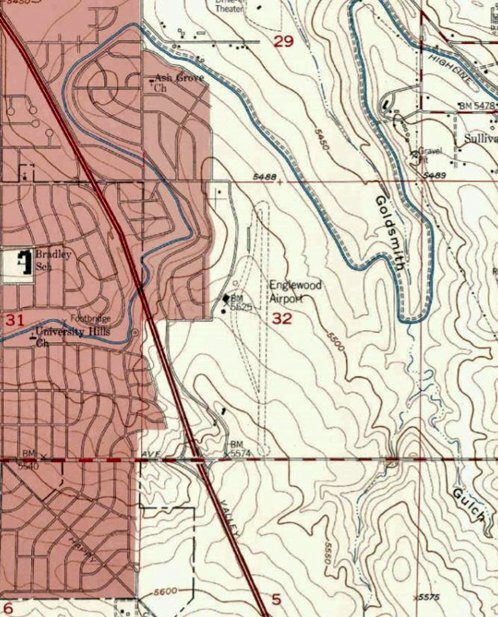 The 1980 & 1985 USGS topo maps still depicted the eastern runway, but the western runway was no longer depicted. A 1993 USGS aerial photo showed residential streets having covered the site of Stouts Airport. A 2015 aerial view showed no trace remaining of Stouts Airport. The site of Stouts Airport is located northeast of the intersection of East Bellevue Road & South Parker Road. Thanks to Ted Frison for pointing out this airfield. 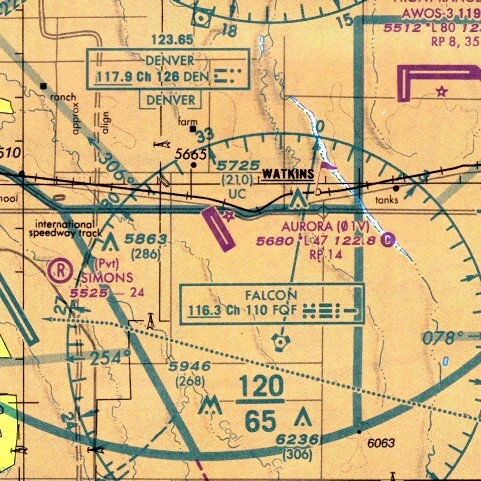 Denver-Douglas Airport, as depicted on the June 1965 Denver Sectional Chart. but when folk observed Arnold Construction equipment working just off Highway 85, north of Castle Rock, it didn't seem to give the appearance of house-building. Upon being asked , Floyd Arnold said that he & Robert Wenger were building a 4,000' runway airport, named the Denver-Douglas Airport. The landing strip will angle about 120 degrees southeast & about 300 degrees north/northwest. 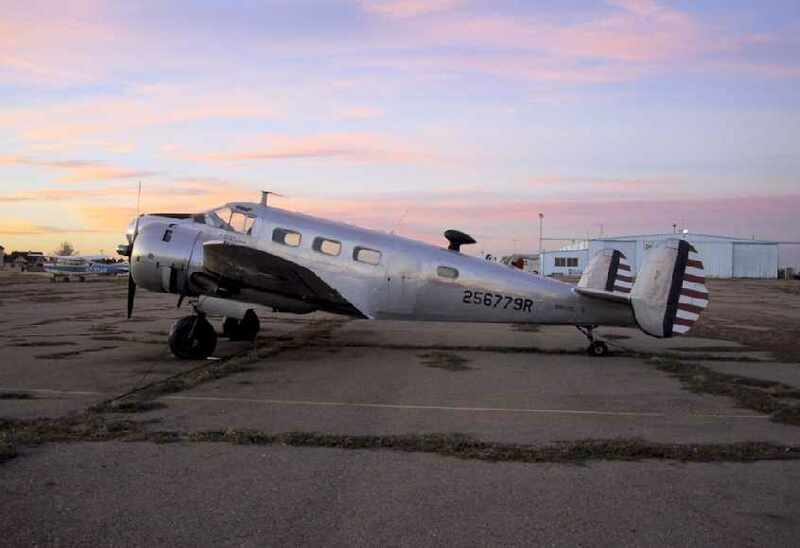 The airport landing strip will accommodate any aircraft up to & including the well-known DC-3. By May 10th, Floyd says, the airport should be in full operation. I remember a friend who was to be in my wedding had to cancel because he was working on building that strip, that was 6/1963. 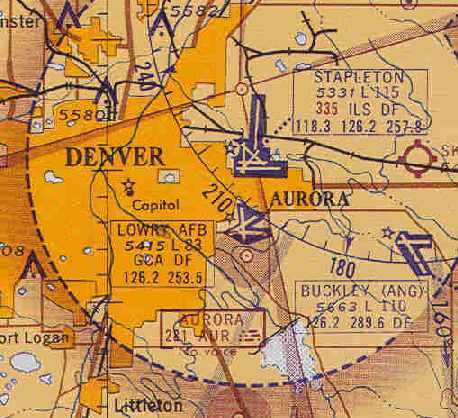 The earliest depiction which has been located of Denver-Douglas Airport was on the June 1965 Denver Sectional Chart. 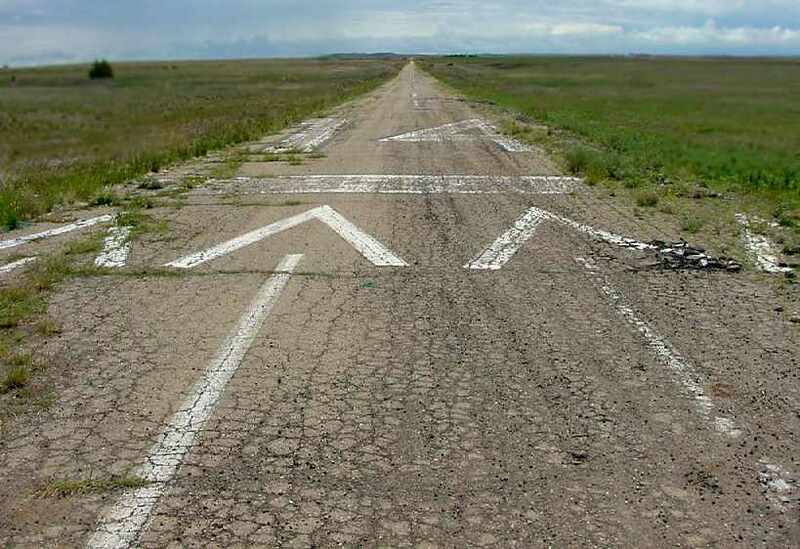 It depicted Denver-Douglas Airport as having a 3,600' unpaved runway. 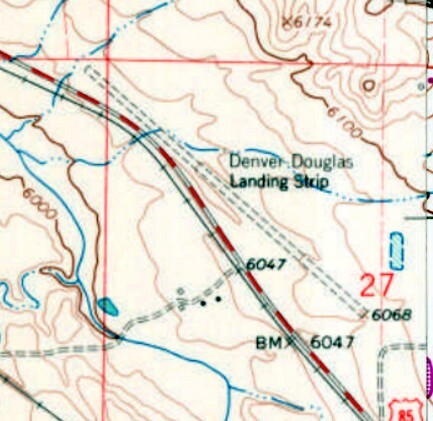 The 1965 USGS topo map depicted “Denver Douglas Landing Strip” as having an unpaved northwest/southeast runway. 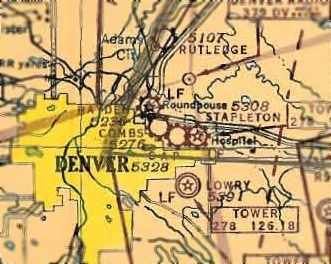 The last aeronautical chart depiction which has been located of Denver-Douglas Airport was on the 1966 Denver Sectional Chart (courtesy of Frank Niehus). Denver-Douglas Airport apparently lasted less than 5 years, as it was no longer depicted at all on the December 1968 Denver Sectional Chart. 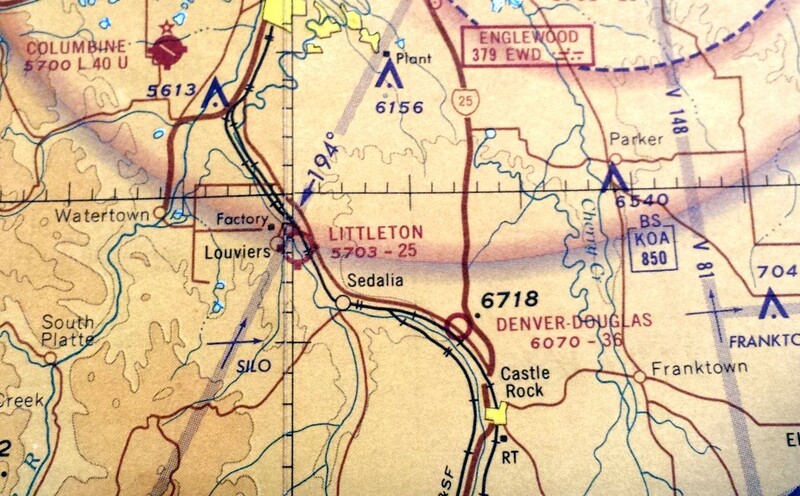 The 1980 USGS topo map still depicted Denver-Douglas labeled as “Landing Strip”, but that most likely indicates it was no longer in operation by that point. 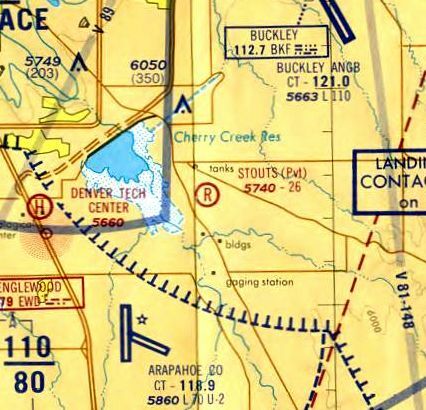 Denver-Douglas Airport was no longer depicted at all on the 1994 USGS topo map. 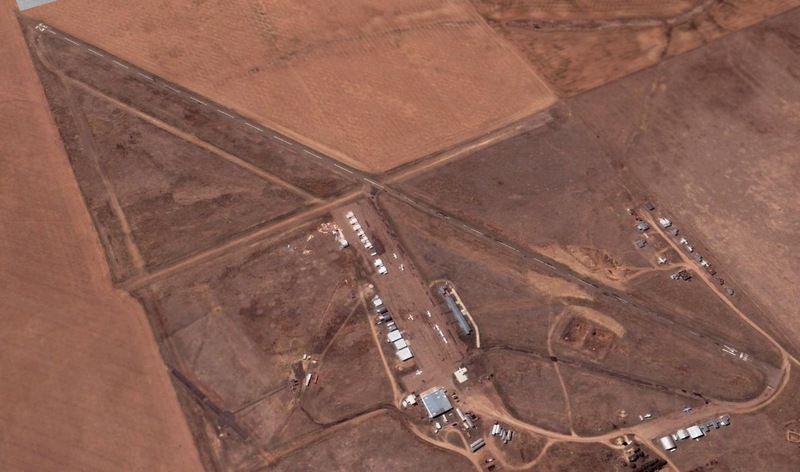 A 2015 aerial view showed no trace remaining of Denver Douglas Airport. 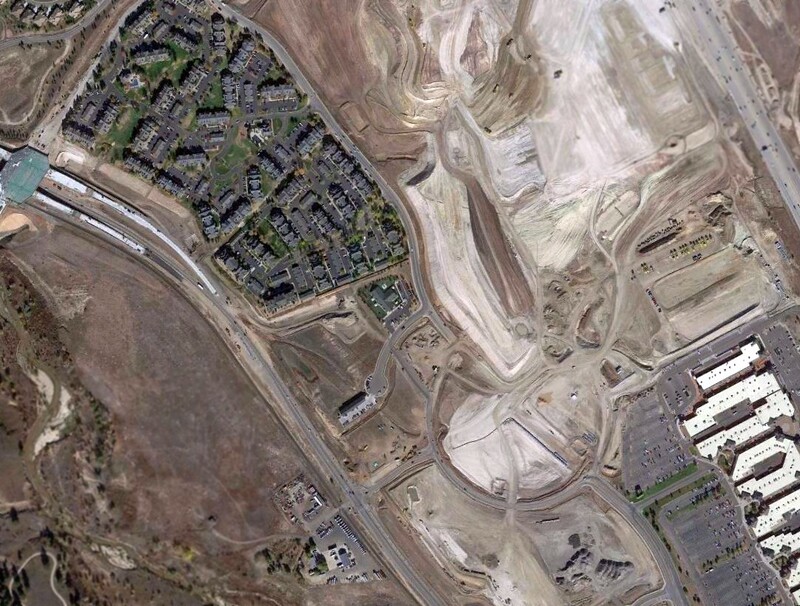 The site of Denver Douglas Airport is located east of the intersection of Route 85 & Castlegate Drive North. Thanks to Frank Niehus for pointing out this airfield. 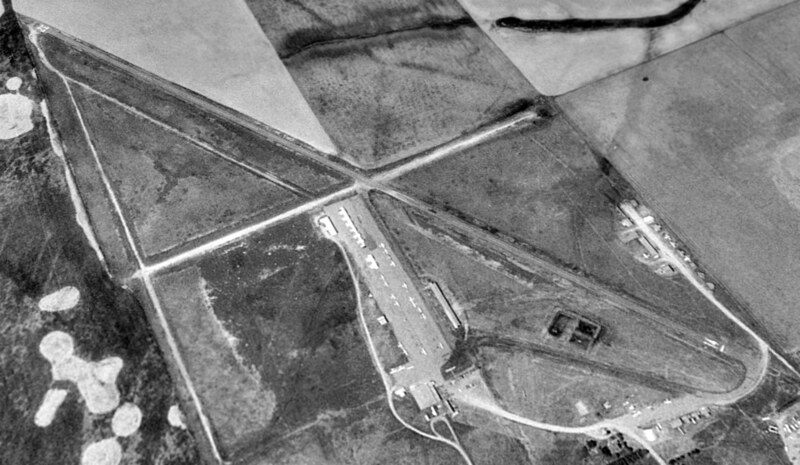 A 10/21/48 USGS aerial photo of East Colfax Airport. as it was not yet depicted on the February 1945 Denver Sectional Chart (courtesy of Richard Doehring). 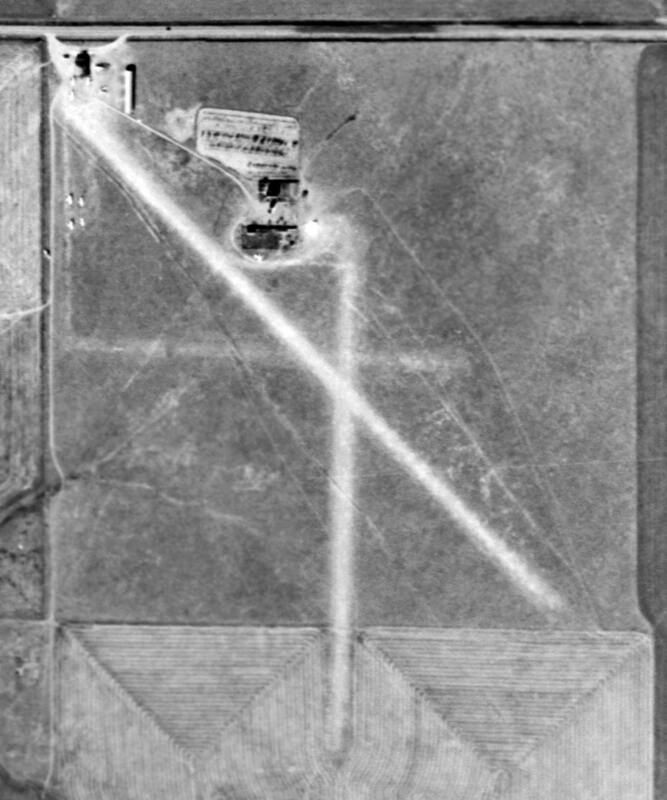 The earliest depiction which has been located of East Colfax Airport was on a 10/21/48 USGS aerial photo. It depicted East Colfax" Airport as having 3 unpaved runways, with a half-dozen light aircraft & a few small buildings on the northwest side. was on the February 1949 Denver Sectional Chart (courtesy of Chris Kennedy). It depicted East Colfax as having a 3,000' unpaved runway. depicted the field as having a 5,000' unpaved runway. as having 2 unpaved runways: 5,000' Runway 13/31 & 2,550' Runway 7/25. and there was also another line of small hangars on the west side of the field. The field was said to conduct skydiving operations. and kept my Cessna 120 tied down there until I sold it in 1970. It was a great place in those days. Denver was about half the size it is now. Flying out of East Colfax was basically unrestricted. The only real problem we had was of course Stapleton and sometimes Buckley ANG Base." as having a 5,000' unpaved runway. that is how it was labeled on the 1976 USGS topo map. 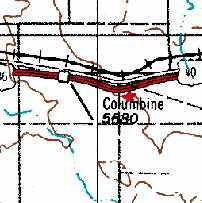 That must have caused confusion, as there was also another Columbine Airport in nearby Littleton. 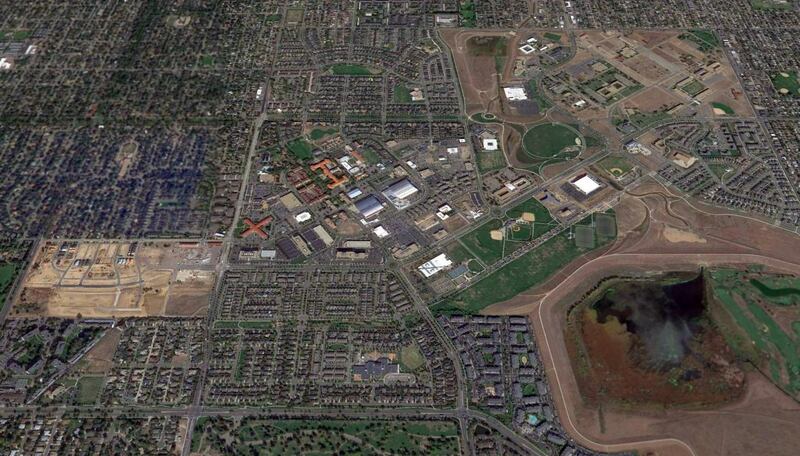 It was depicted as having a single runway, oriented northwest/southeast. 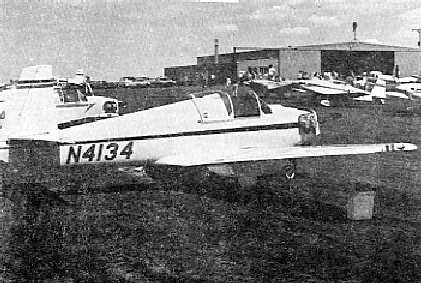 A 1976 photo by Larry Dale of a Mooney M-18L Mite at Columbine Airport. 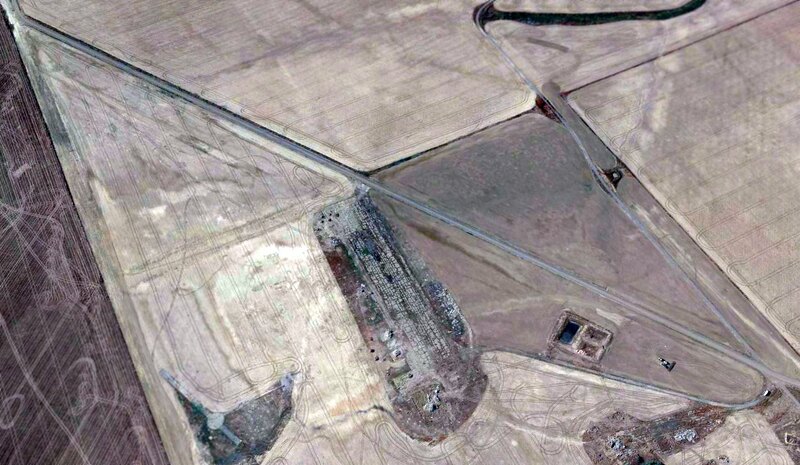 depicted Columbine Airport as having a single 5,000' paved runway. and a 2,550' dirt Runway 7/25. The field was said to offer fuel, major repairs, tiedowns, hangars, charter, flight instruction, and plane rental. 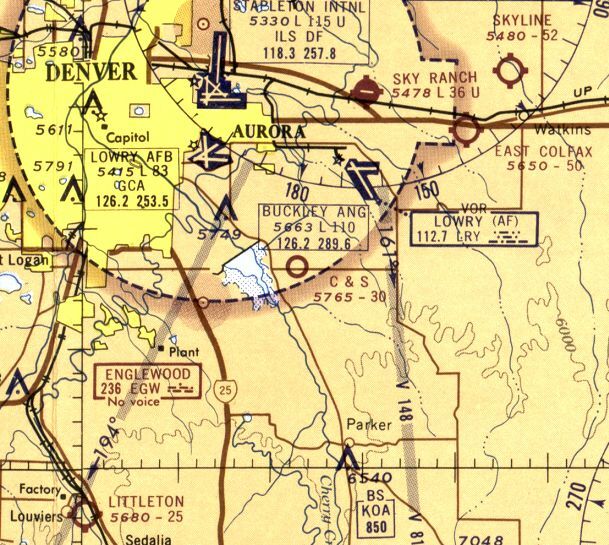 as the August 1985 Denver Terminal Chart (courtesy of Stu Sibitzky) depicted Aurora as having a single 4,700' northwest/southeast paved runway. The June 1989 Denver Terminal Chart (courtesy of Robert Brown) depicted Aurora as having a single 4,700' paved runway. and a 2,300' dirt Runway 8/26 (which was closed to transient aircraft). A large number of small hangars were depicted on the northwest & northeast sides of the field. The field was said to conduct operations by ultralight aircraft & cropdusters. as well as a substantial number of aircraft visible parked outside. 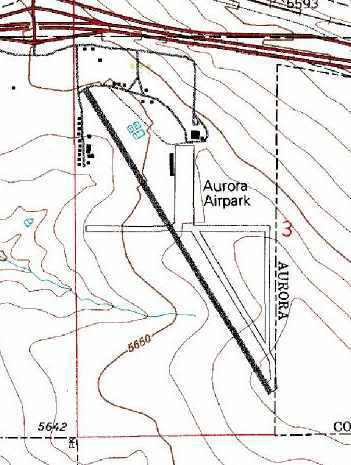 By 1998, the USGS topo map showed that the airport had been renamed Aurora Airpark. was on the August 1999 Denver Terminal Aeronautical Chart (courtesy of Ron Plante). It depicted Aurora as having a 4,700' paved runway. 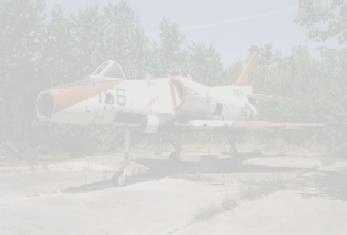 A 9/17/00 photo by AirNikon of what appears to have been 2 homebuilt aircraft, abandoned before their completion. The photo was taken behind a gas station adjacent to Aurora Airpark. A beautiful sunset picture by Fabian Lorentz of a Beech 18 (N95622, "immaculate inside & out"), caught at Aurora Airpark on 10/19/01. with at least 10 aircraft visible parked outside. 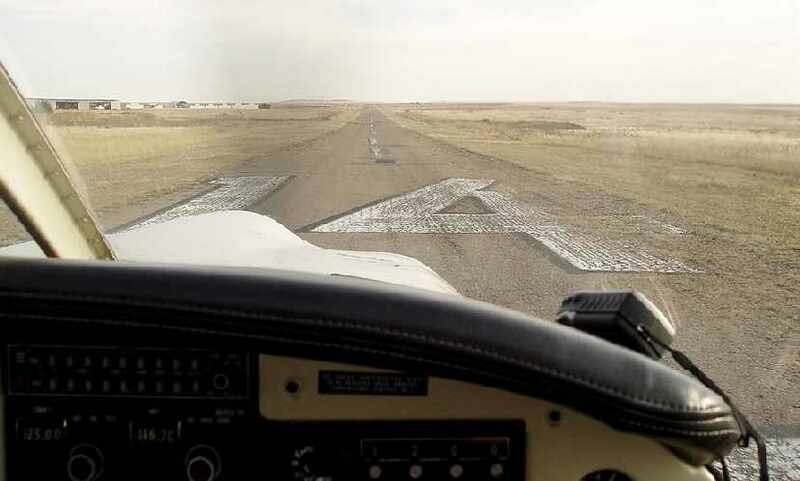 An 11/9/03 photo by Craig Mills, departing from Aurora Airpark's Runway 14 in a Piper Arrow. 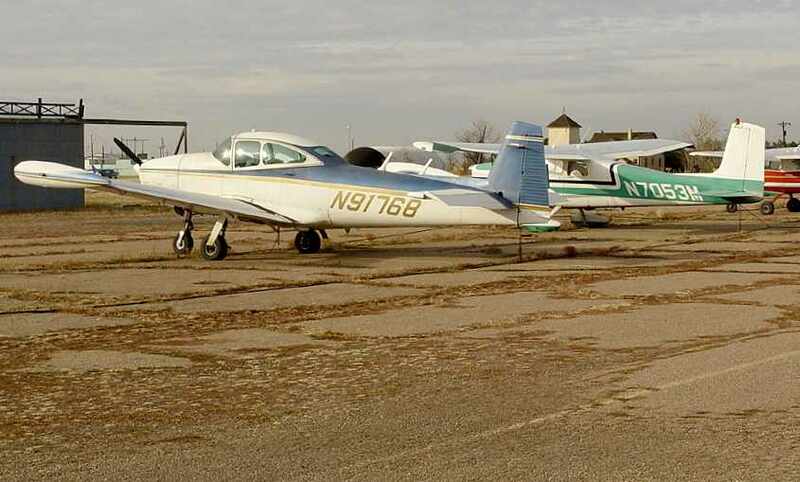 An 11/9/03 photo by Craig Mills of a Navion & 2 Cessnas at Aurora Airpark. in which the number of aircraft visible on the field had dwindled to only 9. 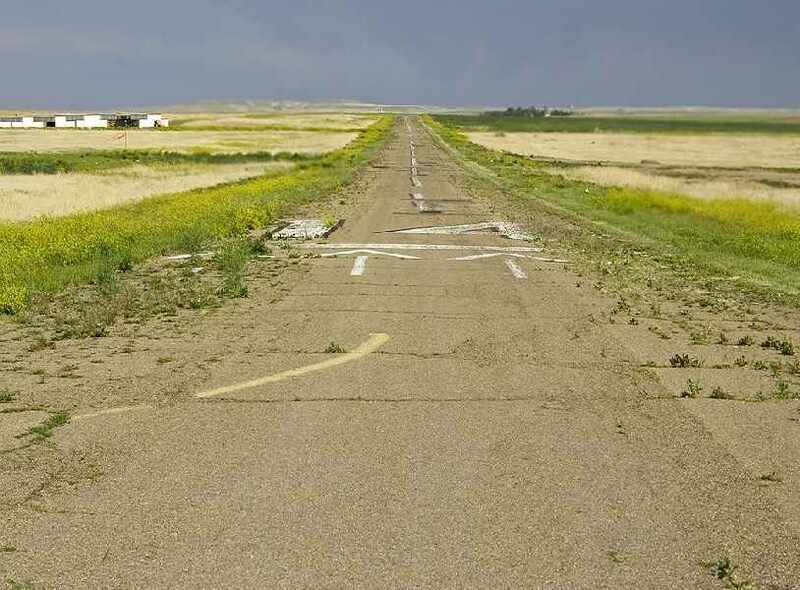 A 6/3/04 photo by Craig Mills looking southeast along Aurora Airpark's Runway 14 in its final days. with the Falcon VOR visible in the background. forcing us to move to nearby FTG. While our plane is better off for it (FOD from gravel on the runway = prop that looks like a cheese grater), I miss the place. It was run like a small town, everybody knew each other. Many different activities took place there other than aviation. "I only know about the field closing because my friend based his Arrow there. there has been lots of interest in eventually developing it into some kind of commerce buildings. The sticking issue was water rights, but those just recently got cleared up, so the go ahead to close the field has been given. The date of closure is 6/15/04." 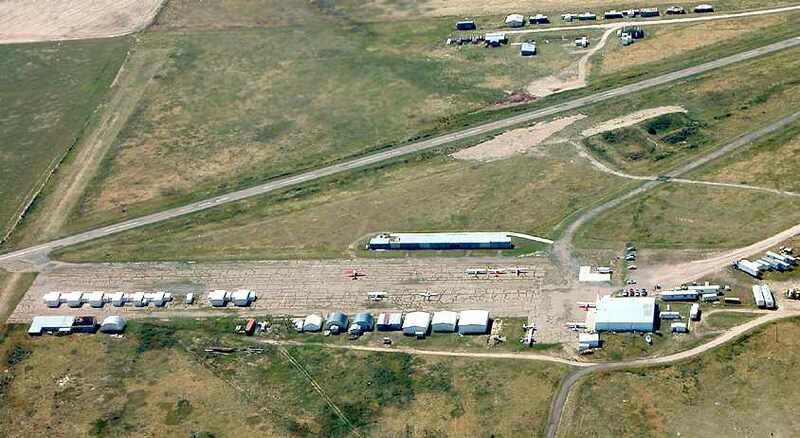 located a mere 5 miles to the north of the little Aurora Airpark. which came down to only 200' above Aurora's traffic pattern altitude(according to Aurora pilot Richard Werry). as well as a 2,300' turf/dirt Runway 8/26 (described as "in fair condition"). and the field was said to conduct an average of 60 takeoffs or landings per day. A 9/18/04 photo by Craig Mills looking northwest at the abandoned Aurora Airpark. A sad 9/18/04 photo by Craig Mills, looking north at the abandoned hangars of Aurora Airpark. Scott Krugerud reported in 2005, “My family & I still take our dogs out there to run in the open space. As of yet, no construction has started and it will be some time until it does. There is trash everywhere, mostly leftovers from the cheap hangars. My understanding is that is the reason the airport was closed. It had been for sale for many years. 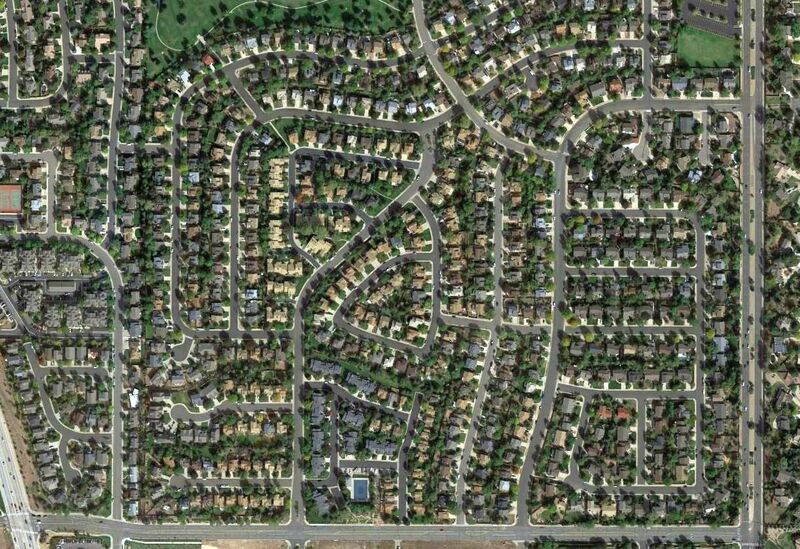 The zoning commission in Arapahoe county had petitioned to rezone quite some time before, but nothing was ever done. The junk is still there, but the planes are gone. Most of the hangars are gone now. Only the shells of the tin roofed hangars next to Runway 14 are still there. “In my opinion, the property is going to sit for some time. while there is virgin farmland on all sides that is also for sale. to occur on roughly 900 acres that also includes the site of the old airport. 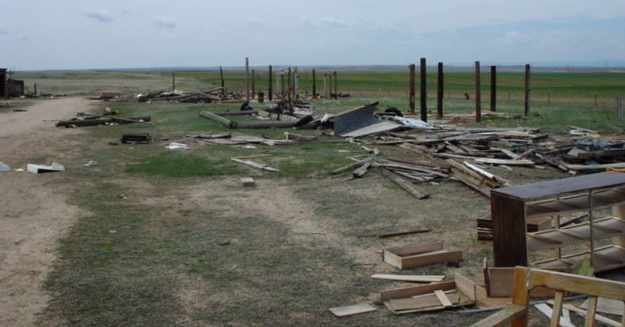 A 2005 photo by Keith Wood, of “what's left of the row of hangars on the west edge of the field. 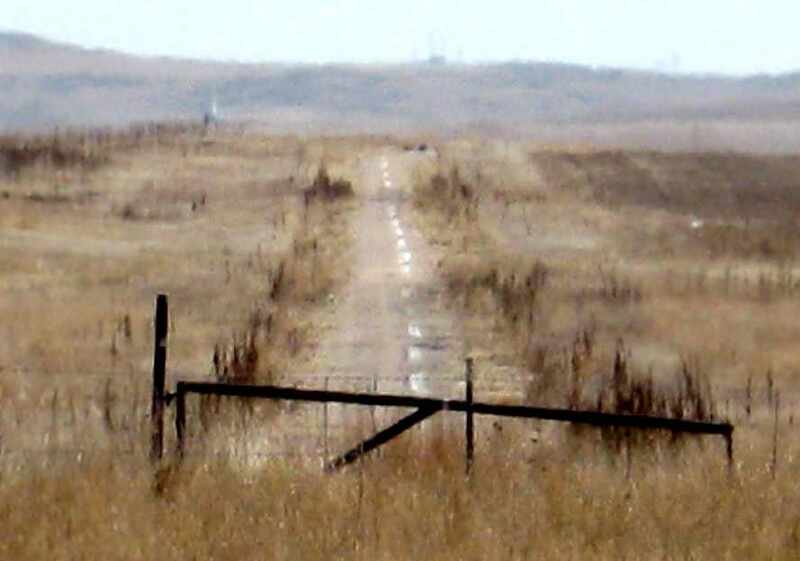 A 2006 photo by Patrick Griffith looking southeast along the former Runway 14 of Aurora Airpark. 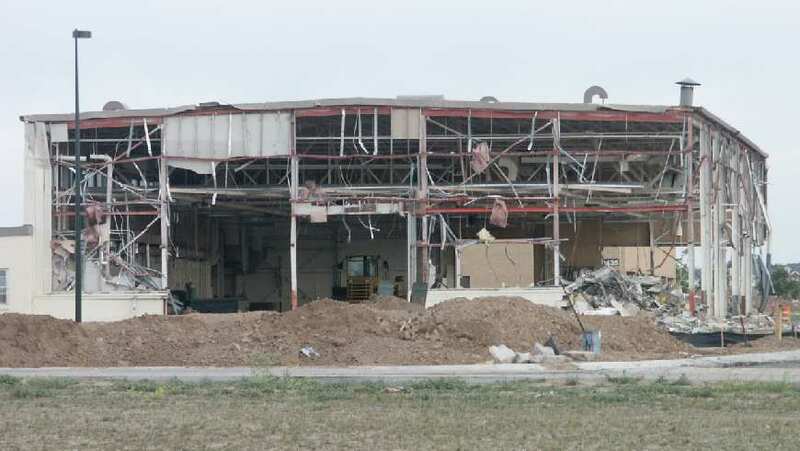 Patrick Griffith reported in 2006, “I stopped by the old Aurora Airpark site today. Not much has happened there recently. All of the old structures are down. There was a large Public Notice sign giving notice of a plan to build the 'Sky Ranch Wastewater Treatment Plant'. [which is somewhat confusing, given that 'Sky Ranch' is the name of another former airport, located somewhat to the northeast]. 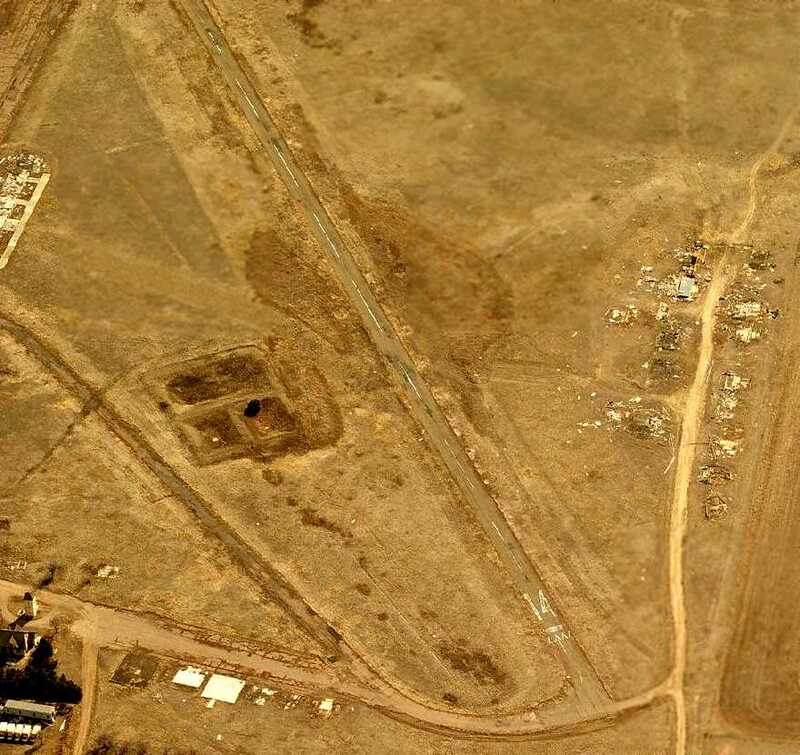 A circa 2006 aerial view looking south along Aurora's Runway 14, showing the wreckage from demolished hangars. 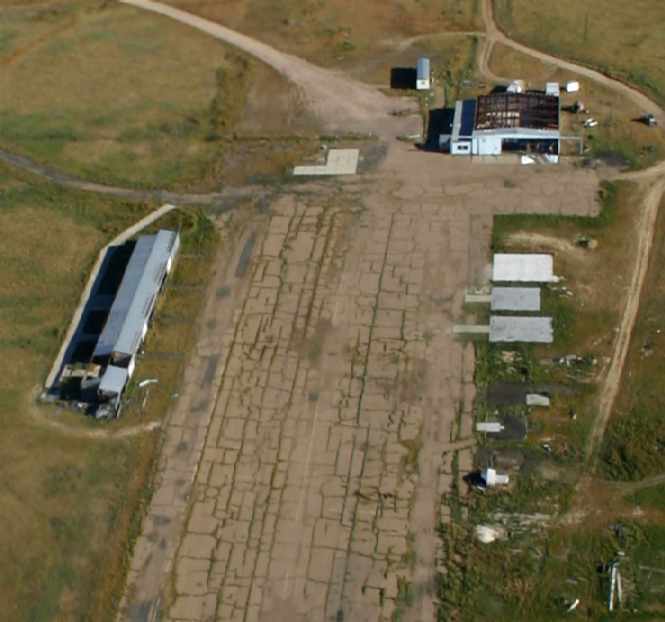 A circa 2006 aerial view looking south at the foundations of Aurora's former hangars. A March 2008 photo by Raymond Cober looking southeast along the former Runway 14 of Aurora Airpark. it looks like the only difference between this & when the airport was still active was that the grass was trimmed! where the 2 abandoned half-built kitplanes were located (in preceding photo). both of which had been abandoned for as long as I can remember, long before the airport's closure. Like most of the airport structures, this site has been nearly completely removed as well. A man by the name of Shawn Dougan (who happens to work at nearby Front Range Airport) came by & gave me more information. and they still were, operating out of a purpose-built mini-airfield adjacent to the property [east of the airport]. Beyond the the large main hangar with its adjacent offices would've been visible. In the background you can see a house & a tower along with a clump of trees. or whether or not their construction predates the airport or not. I would guess the tower served to store grain or equipment, but it was sometimes jokingly referred to as the airport's ATC tower. I do not recall if they were occupied when the field was in operation, but both were found in a derelict state when I photographed them. The road that leads into the airfield bisects the clump of trees. showing the runway remains largely intact, but all of the buildings have been removed. 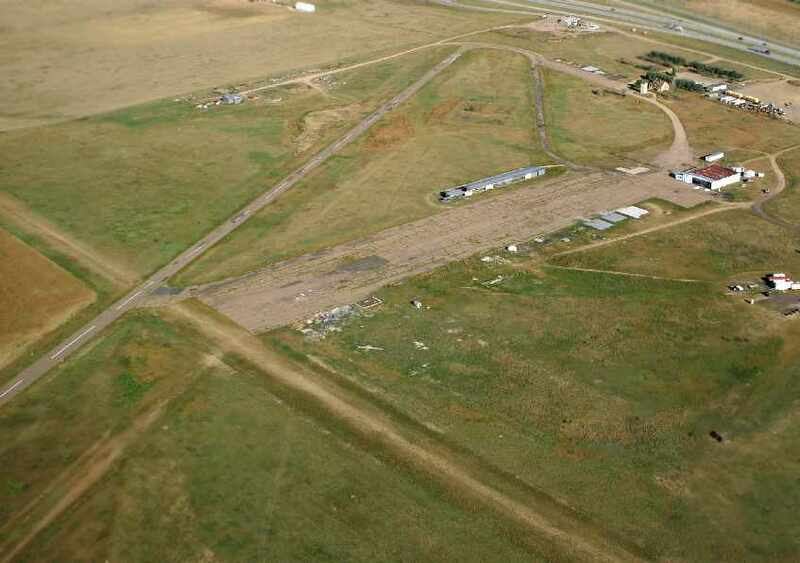 Aurora Airpark is located at the southern terminus of East Colfax Road, along the south side of Interstate 70. 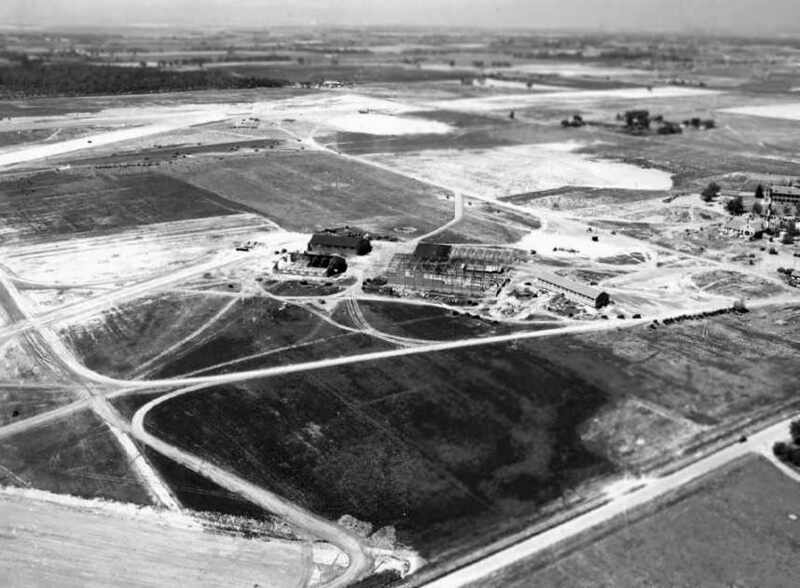 A 7/20/38 aerial view of Lowry Field (courtesy of David Brooks) showing the hangars & runways while under construction. and began looking for a new facility where it could consolidate all of its Air Service Technical training schools. a military committee submitted a list to Congress with the names of 6 cities that would meet their needs. but Chanute remained the headquarters of the Air Corps Technical School & home to the aircraft mechanics school. The Army formed a new branch for armament & photography training in Denver. to convert the grounds of the former Agnes Memorial Sanatorium into a modern airfield. a Denver native who had been killed when he was shot down in 1918 while serving as an aerial observer. which was operated by the Colorado National Guard from 1924-38.
the Denver branch of the Army Air Corps became an Army post of 880 acres. 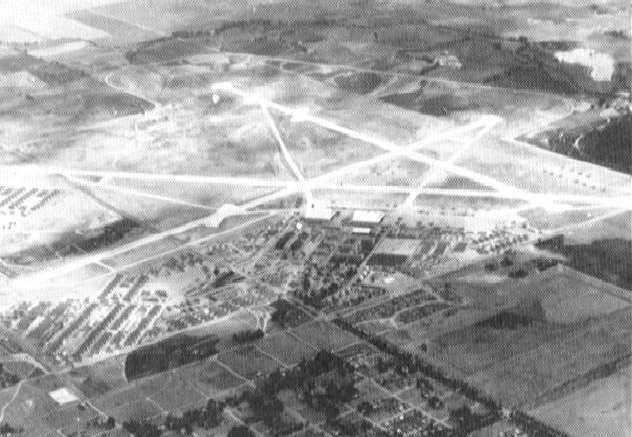 A bombing range of 64,000 acres was acquired in 1938.
as an auxiliary landing field, and named it Buckley Field. Classes at the new Lowry Field began on 2/28/38. Ten students graduated from the Armament Department on 3/19/38. Several months later, 10 photography students received diplomas in advanced aerial photography. A 7/30/38 aerial photo (courtesy of David Brooks) showing the hangars & runways of the new Lowry Field while under construction. where they shared a hangar with the Colorado National Guard. the first of 4 portable National Guard hangars was erected. On June 30, nine aircraft flew from Municipal Airport to Lowry Field. and the 8,000' north/south runway was completed in December. The first aircraft to land on the new, paved runway was a B-18A Bolo twin-engine bomber. 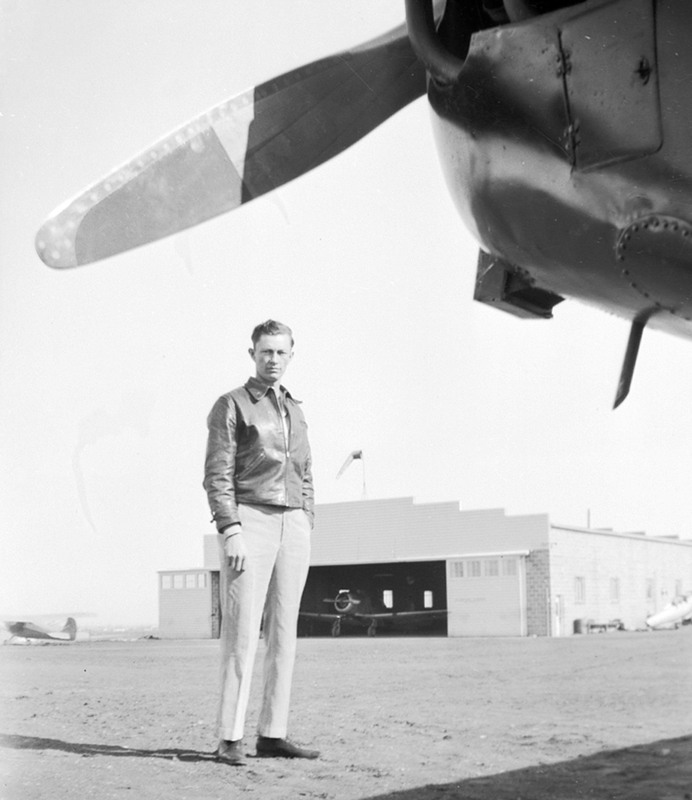 The earliest photo to be located showing an aircraft at Lowry Field was a 1939-40 photo of a Douglas B-23 Dragon bomber in front of a Lowry hangar. In January 1940, Lowry Field had a complement of 44 officers, 1,350 enlisted men including 600 students, and 27 aircraft. As the international situation worsened, the Army acquired additional land. Following 12/7/41, the inflow of trainees increased. In January 1942, the War Department tasked Lowry with annually training 57,000 men. To accommodate the larger student population, construction of Lowry Field #2 was begun. Lowry #2 was built on the northeast side of the post beyond 6th Avenue. It opened in July 1942. In addition, Armament School #2 was established at Buckley Field. Lowry trained only bombardment armorers while Buckley prepared armorers for fighter aircraft. 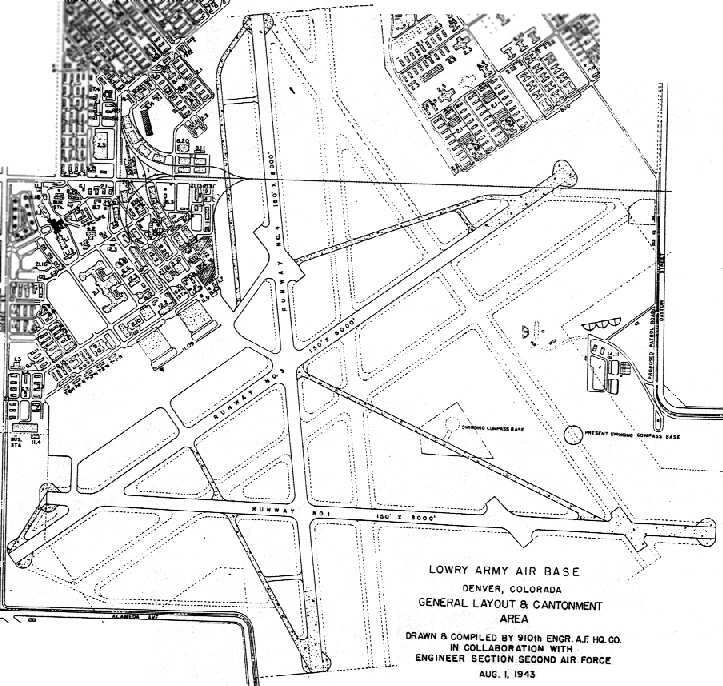 A 1943 street map (courtesy of Rex Ricks) depicted Lowry Field's original runway arrangement, with 2 perpendicular runways with several hangars to the northwest. 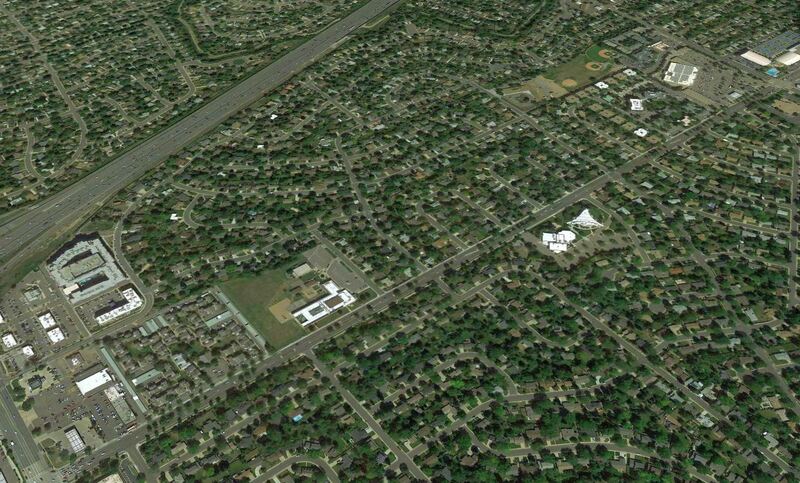 and a cantonment area with hundreds of buildings on the north side of the airfield. The plan also depicted a planned addition of 3 other runways, but these were apparently never built. Lowry Field in the mid 1940s. A 1943 aerial view of Lowry Field. In October 1943, Lowry Flight Engineers School was moved to Lowry. In 1944, Lowry introduced courses in radar photography, autopilot maintenance, and B-29 crew training. 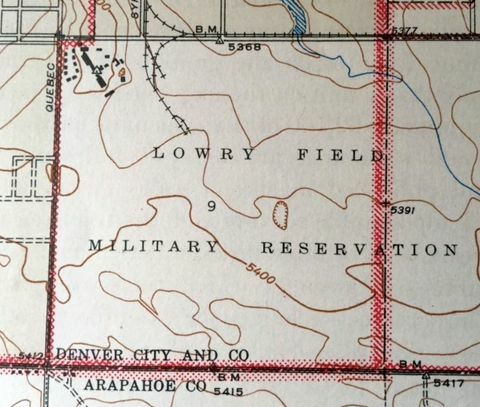 depicted “Lowry Field Military Reservation” as a blank area, presumably due to wartime security concerns. In April 1945, the Crash Fire Fighting & Rescue School moved to Lowry from Buckley Field. Also in 1945, production of B-29 Superfortresses reached a level that necessitated another school for pilot & crew training. 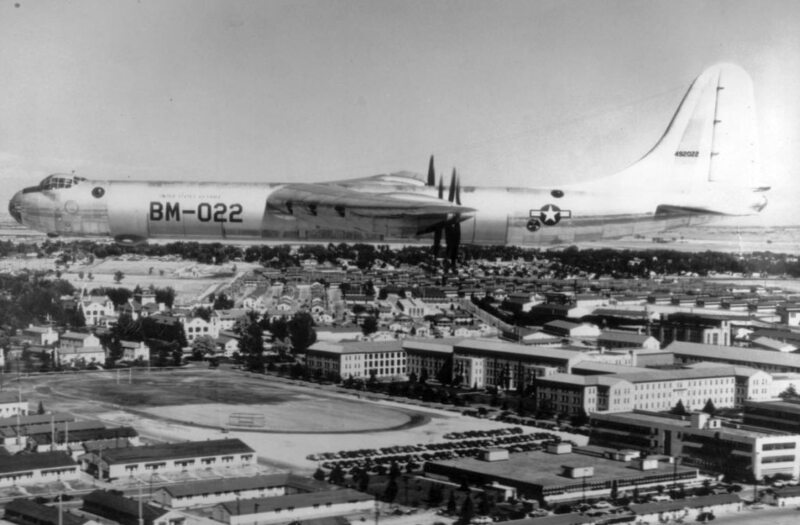 Forty-two B-29s arrived at Lowry in May & the 6-week course began in July. At war’s end, 2 classes remained at Lowry along with 39 Superfortresses. The classes never completed training. The end of the war in Europe in May & V-J Day on August 15 ended Lowry’s short history as a pilot transition training school. Lowry quickly returned to a peacetime schedule. Staffing decreased & student enrollment plummeted. It became a separation center for returning veterans. By the end of the 1945, Lowry was processing an average of 300 discharges a day. 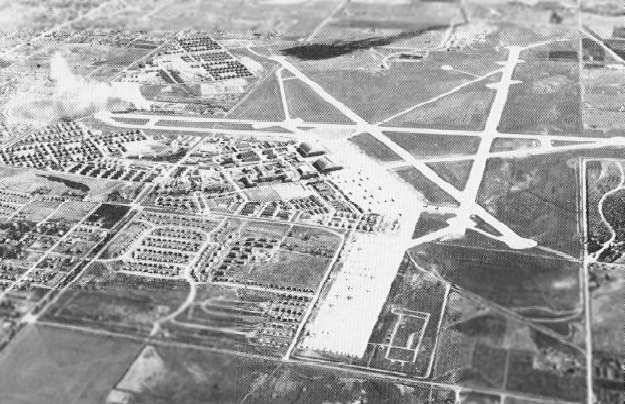 In 1948, with the postwar reorganization of the military, Lowry Field became Lowry Air Force Base. depicted Lowry as a military airfield. A 1946-49 photo by Bruce Reid (courtesy of Don Reid) of the Lowry Field Operations building, control tower, and Hangar #2. Note the early-model B-17 at bottom-right. 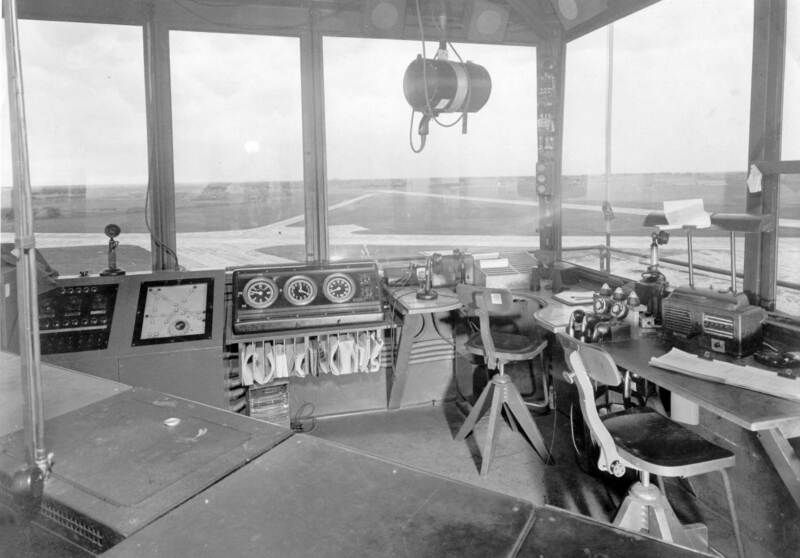 A 1946-49 photo by Don Reid (courtesy of Bruce Reid) of the interior of the Lowry Field control tower. Bruce reported that his father, Don Reid, “was tasked with coming up with a standard console design for all towers of that era. 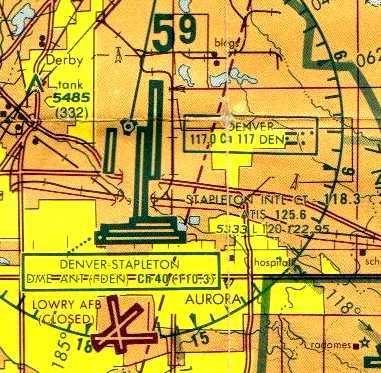 A 1948 street map (courtesy of Rex Ricks) depicted Lowry Field's proximity to Stapleton Airfield. depicted Lowry AFB as having an 8,300' hard surface runway. Paul Goebel recalled, “Lowry Air Force Base... In 1951, there was heavy traffic of B-36 planes taking off & landing. 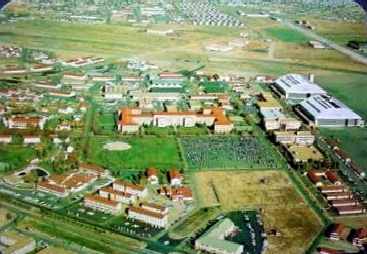 A 1950s postcard aerial view looking east at Lowry AFB (courtesy of Rex Ricks). 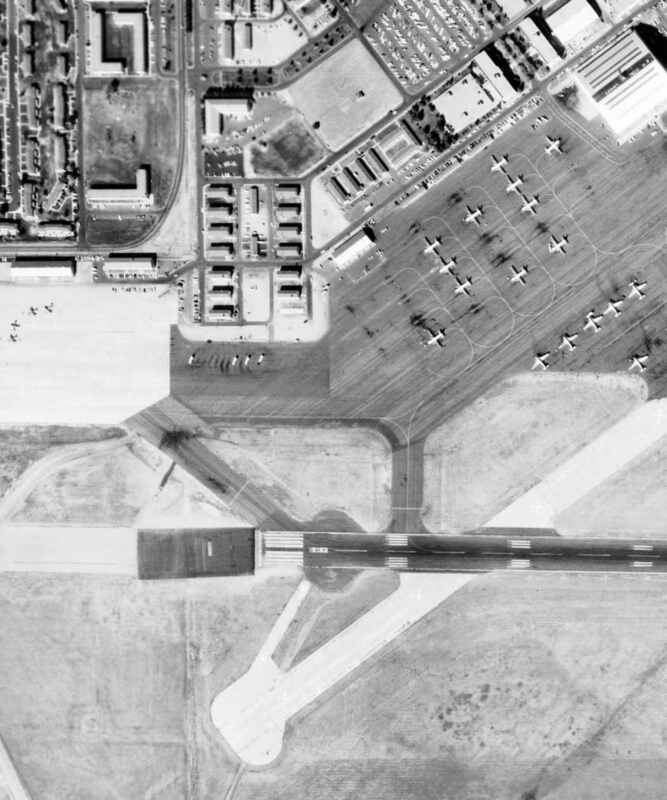 A 9/3/53 USGS aerial view depicted a large number of aircraft at Lowry AFB. In 1954, President Eisenhower signed a bill authorizing an Air Force Academy. 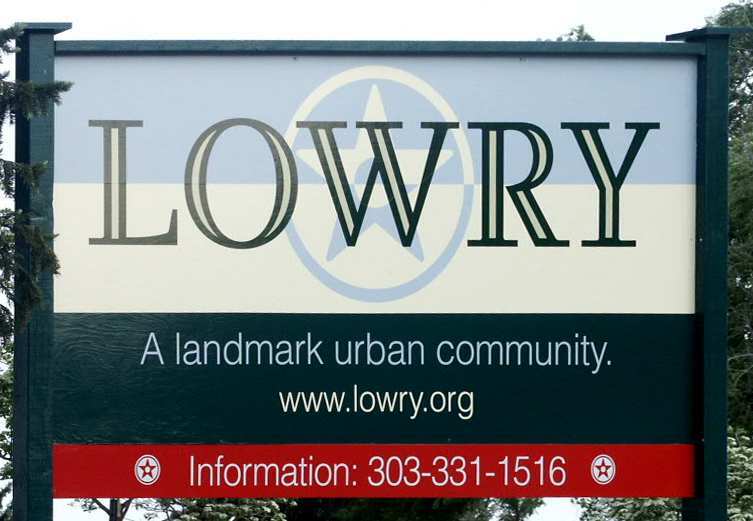 Lowry was selected as the Academy’s interim home until construction was completed in Colorado Springs. The first class of cadets arrived in July 1955. In the 1950s Lowry AFB immediately responded to the North Korean incursion with an expanded training program. computer specialties, gun & rocket sights, and electronically operated turret systems. Lowry lost one of its traditional courses, aerial photography, in February 1956.
made aerial photography specialists redundant. Programs in camera repair & ground photography, however, continued to be taught. A circa 1950s aerial view of a massive Convair B-36 Peacemaker bomber overflying Lowry AFB. 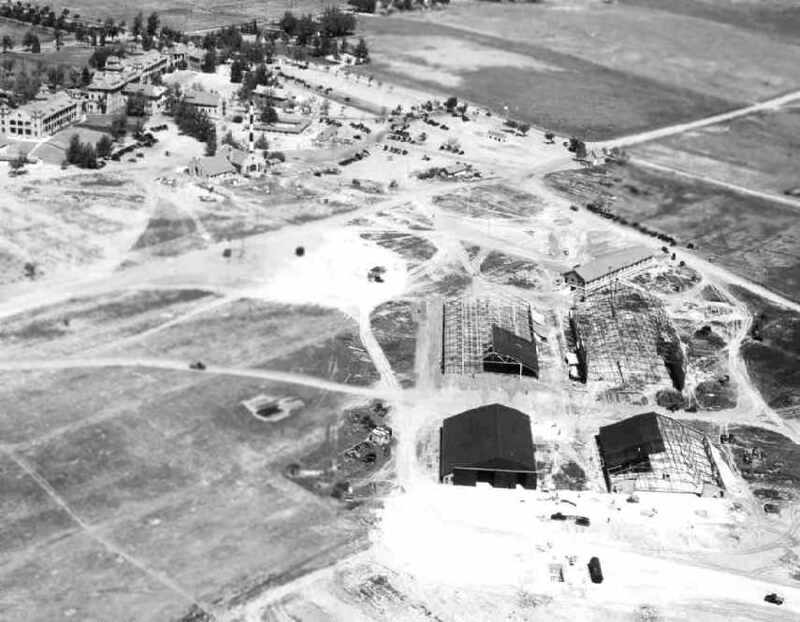 The Air Force Academy occupied facilities at Lowry #2 until 1958. The 1960s marked the end of an era at Lowry. The 3415thTechnical Training Wing became Lowry Technical Training Center. which had made it increasingly unsuitable for flight operations. The base was closed to all transient air traffic in June 1960. The 451st Strategic Missile Wing operated 2 HGM-25A Titan I equipped missile squadrons from its Lowry support base. The 724th Strategic Missile Squadron operated 3 missile sites from 2/1/60-1/25/65: 724-A, 724-B, and 724-C. The 725th Strategic Missile Squadron operated 3 missile sites from 8/1/60-1/25/65: 725-A, 725-B, and 725-C.
Lowry was down to only a single remaining operating runway: the 8,283 paved Runway 8/26. along with an extensive system of taxiways, ramps, and hangars. disaster control, armament, nuclear weapons, and weapons loading. that instructed in storing, maintaining, assembling, testing, and handling nuclear components. 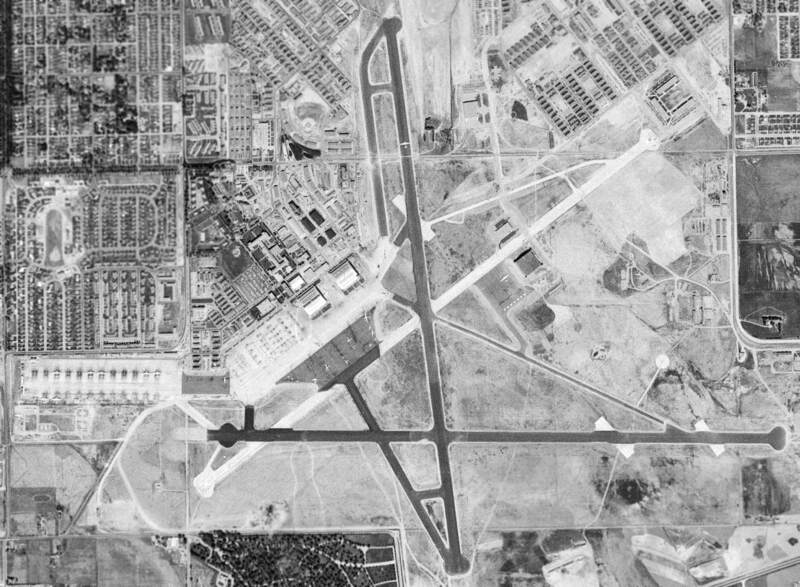 depicted Lowry AFB as having 3 paved runways, with the longest being 8,300'. By 1964, Lowry's 3415th Technical School was graduating more than 10,000 people annually. 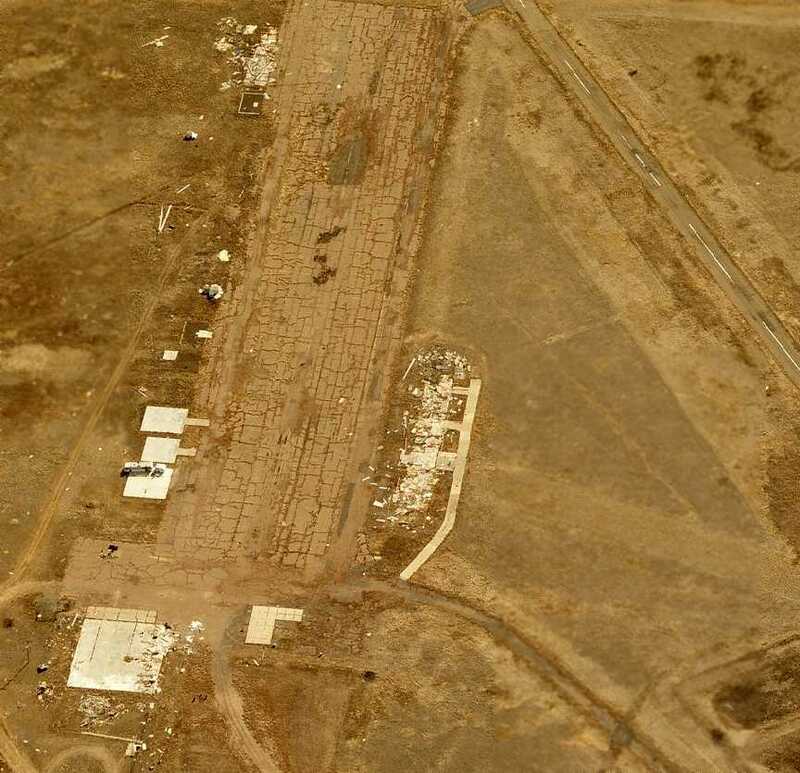 The last photo which has been located still showing aircraft operating from Lowry AFB was a 10/20/64 USGS aerial view. A closeup from the 10/20/64 USGS aerial view of Lowry, showing single-engine aircraft on the west ramp & larger twin-engine transports to the east. 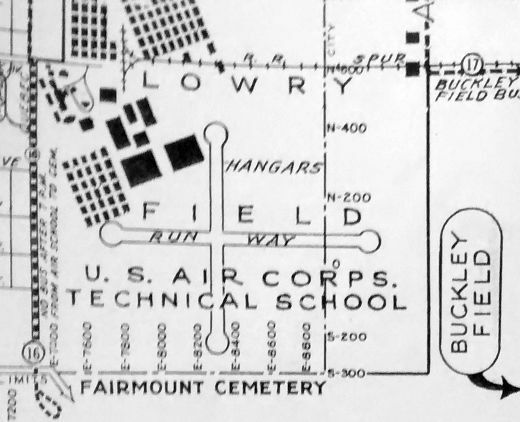 In 1964 Lowry’s remaining flight operations were shifted to Buckley Field. All Lowry flying activities ceased completely in June 1966 when the last T-29 was flown out of Lowry to Buckley. the 3 paved runways of Lowry were still depicted, but the field was labeled as Closed. After the end of flight operations at Lowry, new programs were added. Intelligence training returned, and airmen were trained for the Southeast Asia conflict. The look of Lowry began to change in the 1970s. Almost 200 WW2-era wooden buildings were replaced with brick structures. and 5 buildings for the 3320th Correction & Rehabilitation Group. To put more emphasis on technical training & the aerospace mission, the Air Training Command reorganized its schools in 1972.
comprised of Avionics, Aerospace Photography, Aerospace Munitions, Special Instruments, and Logistics departments. An undated aerial view looking north at Lowry AFB from the 1976 CO Airport Directory (courtesy of Alex Hauzer). but the airfield was labeled as “Closed”. In 1977, the Air Training Command was realigned along more traditional military lines. Lowry’s school became the 3400th Technical Training Wing. The training departments became technical training groups. They were the 3420th Intelligence, 3430th Audiovisual, 3440th Logistics, 3450th Avionics, and 3460th Munitions groups. The basic wing-group structure continued into the 1980s. 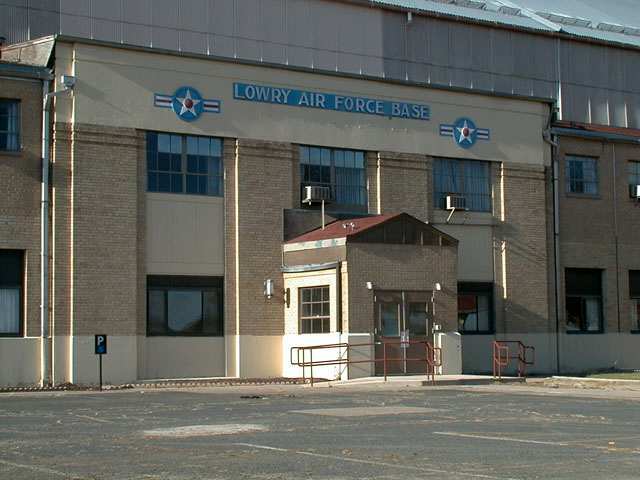 Lowry first faced the possibility of base closure in 1978, but Air Force recommended keeping Lowry open. Lowry Technical Training Center introduced new & improved courses for the 1980s. Lowry became the primary training center for space operations courses & began Undergraduate Space Training for officers. Lowry also handled ground & armament training for the F-15, F-16, A-10, and B-1 bomber, as well as the Short Range Attack Missile (SRAM). Lowry was also instrumental in training munitions handling for modified B-52 bombers. A 1987 photo of a Boeing KB-29 Superfortress of the Wings Over The Rockies Air & Space Museum at Lowry AFB. On 10/1/87, Lowry observed its 50th anniversary. The June 1989 Denver Terminal Chart (courtesy of Robert Brown) depicted still depicted the layout of Lowry's 3 runways. 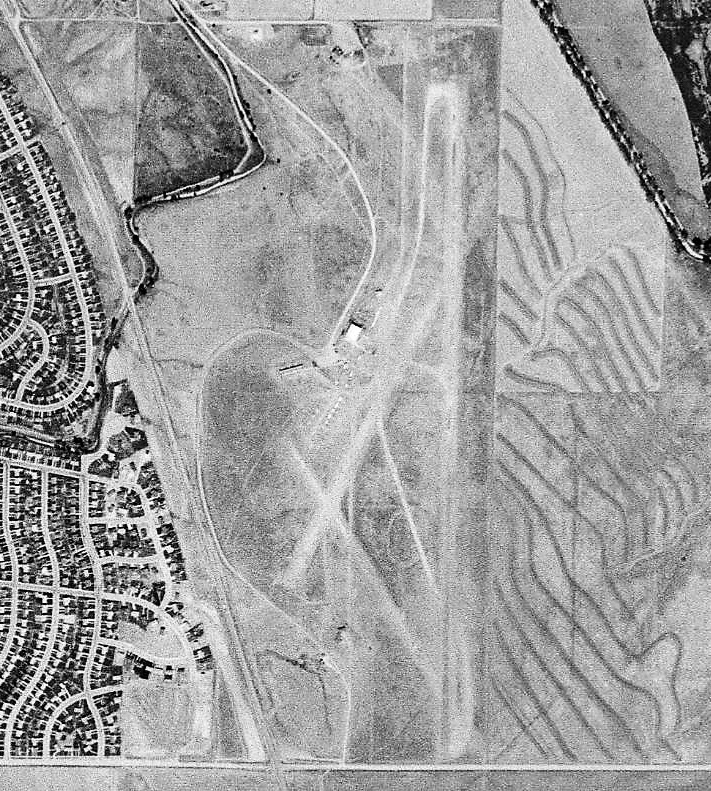 A 1993 USGS aerial view looking north showed the characteristic layout of Lowry AFB's former runways was still apparent. 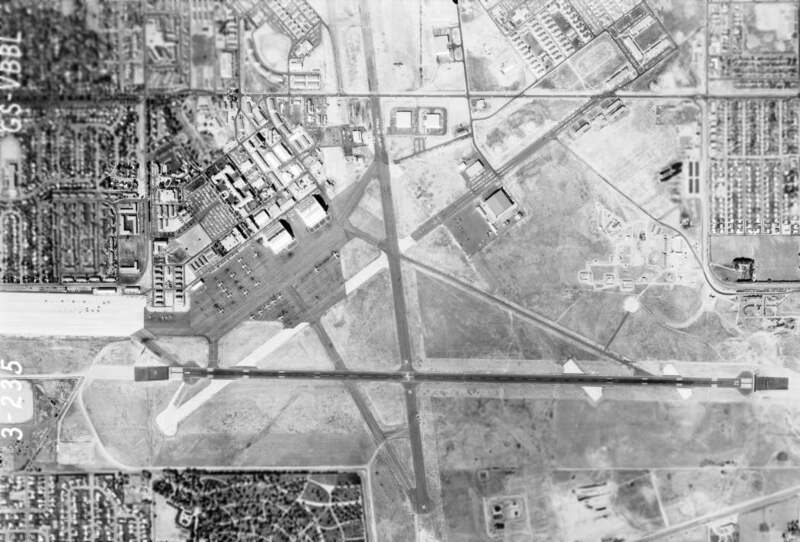 The last aircraft to remain on the base after its runways were closed was a single B-52B bomber, visible in the center of the photo. Characterized by more reorganization, the 1990s saw the beginning of the end at Lowry. The end of the Cold War, along with the resultant budget cuts & downsizing made base closure a reality. In 1993, Lowry prepared to end 56 years of technical training. While training continued, Lowry’s command structure planned to implement the closure in an efficient manner. The Air Force deactivated the 3400th Technical Training Group on 4/27/94. but the death of former President Richard Nixon caused the ceremonies to be postponed to the 28th. The official deactivation date, however, remained the 27th. almost 57 years to the day that it was first raised at a new base. which opened in the former Hangar #1 in 1994.
cover the land once occupied by hundreds of acres of concrete runways. 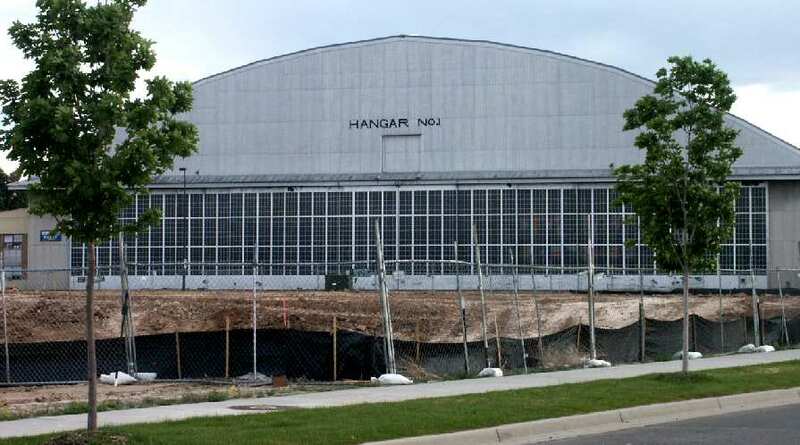 The only remaining hangar is presumably the former Hangar #1, which continues to house the museum. A recent photo of a restored hangar at Lowry. of a B-52 on display in front of Lowry's Hangar 2. A 2002 photo by Tim Tyler of Lowry's Hangar #1.
along the former flight line adjacent to Hangar #1. A 2002 photo by Tim Tyler of a sign at the development which is being built over a portion of the former Lowry AFB. 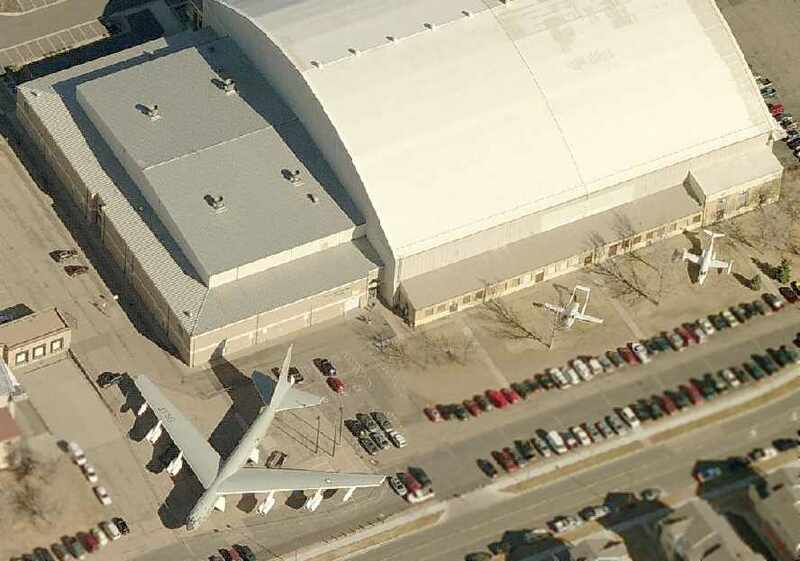 A circa 2006 aerial view looking north at a B-52, an Adam A500, and a Learjet on display in front of Lowry's Hangar 1. A 2007 photo by Scott Murdock of Lowry Field's former Hangar 1. A 2007 photo by Scott Murdock of another former Lowry Field hangar. A 2007 photo by Scott Murdock of 2 former Lowry Field hangars. but several hangars & a static display B-52B bomber are visible in the center of the photo.